Isn’t it nice that just the right flowers bloomed for the occasion? Roses and violets are fine, but these have their own appeal. Happy Valentine’s Day! Cute poem and magnificent flowers, great combo for today. I was delighted to find them last weekend — and a little surprised. But once they were found, they clearly needed to be shared, and today was the perfect opportunity. They certainly will do. How lovely. Aren’t they pretty? The spiderwort I see usually is more lavender-to-purple, so this truly blue one was a special find. I can see that your creative juices flowed in profusion this morning! The flowers are gorgeous. Happy Valentine’s Day! My grade school friends and I used to delight in creating silly variations on the ‘Roses are red, violets are blue’ theme. Clearly, I still have the impulse, and these early bloomers triggered it. Happy Valentine’s Day to you! A perfect Valentine greeting! Happy Valentine’s Day! And to you, Jeanie! I saw a heart-shaped loaf of bread in a bakery yesterday and thought of Rick. I hope the two of you have a wonderful day, however you share it. Thus does Saint Valentine change from Italian to native Texan. I assume you’re saving the addition of white for Independence Day. As for the ditty you cleverly transformed, here’s something of its history. What an interesting history. I knew some of the more modern versions, including Roger Miller’s rhyming of ‘purple’ with ‘maple surple’ — but that one can be found at least a decade earlier, when it was popular on a certain Iowa playground. Some rhymes just demand to be made. As for white, it’s around, primarily in the form of crow poison. It’s blooming prolifically this year: so much so that I had to stop along the road at one point just to be sure of what I was seeing. Last week I saw some crow poison here, too, but the flowers hadn’t opened yet. There was an explosion of purple vetch here in the past day or so — probably deer pea vetch. I suspect after these next two or three days of sunshine and warmth, you’ll have new riches to explore, too. Along the lines of purple and surple, vetch is crying out to get rhymed with kvetch. I love kvetch, along with meshuga, verklempt, and tchotchke. They fill up little spaces where an English word just won’t do. Aren’t they lovely flowers? These were the first paintbrush and spiderwort I’ve seen this year, and I thought it was good of them to show up in time for this occasion. I’m glad you like them, too. Goodness — my internal calendar’s out of synch. I had no idea it’s Trail Ride time. I’ve not even heard anyone mention the cookoff. I’d best scan the horizon and see what else I’ve missed. As for the misery index, I see there’s rain forecast for very day next week. What a surprise, huh? At least we have a few days of real sun ahead of us — I’m as happy as the plants about that. Nice! Happy V day to you–lovely shots! I’m amazed (though maybe I shouldn’t be) that the Paintbrush is blooming, seems early, but it’s been a mild winter. My Spiderwort are starting their show now, too! Actually, the paintbrush seem right on schedule for our area. The ones I found were few and scattered, but when I went back through my files for the last four years, they consistently appeared in mid-February. I’m always surprised by how much difference two hundred miles (give or take) can make in (ahem!) a plant’s phenology. I just learned that word a few weeks ago, thanks to a post by Chris Helzer. I had no idea I’d find a way to use it so soon. I’ve yet to see a paintbrush, but I did see a redbud yesterday! There aren’t many paintbrush yet, and some of the barely-emerged ones are really interesting. I wasn’t able to get any decent photos of the most unusual one. It had just a bit of color on the very end of each bract: pink, fuchsia, and bright red, all on the same plant. The crazy thing looked like it had polished its nails. I have seen a lot of azaleas in the past two days — all it took was a little sunshine. Happy Valentine’s. Yes, the trail rides have started. I just saw Mardi Gras decorations and the parades have started in NOLA. February is an exciting month here. I was in Galveston on Sunday, and the decorating certainly has begun. I’m not so fond of the parades — mostly because of the crowds, and the drinking — but I do love the rural Mardi Gras celebrations in Louisiana. I don’t think I can get over there this year, but it’s always great fun. I also don’t care for the drinking either. I was in NOLA a few years ago and met a woman that was from Georgia and had joined a krewe. It was a family krewe and had very strict rules about behavior and held their parade early for families. It was fun to find a new way to acknowledge the day. I’m so pleased that nature gave me the nudge! They’re blooming already??? Doggone it, I’m gonna miss ’em again! Happy Valentine’s Day, Linda — thanks for proving spring is on its way! Are you headed down this way? You might not miss them, depending on your schedule. These were just advance scouts, not the whole regiment. I’d bet that it will be a month before they get to their peak, and maybe a little longer. I saw perhaps two dozen, and they were widely scattered. But, yes: spring is on the way, and it’s moving faster every day. I saw budding willow trees today, and fresh leaves on something I couldn’t identify. It is mid-February, so you’ll be seeing some real spring soon. How I wish I were heading south right now! ‘Tis still winter up here, and I have some obligations to tend to, or I’d be hitting the road. Keeping my fingers crossed I can travel within the next couple of months though! We’re in the same situation. I’m starting to get wanderlust as a result of seeing spring’s arrival, but there are things to tend to before I can go wandering off. Happy Valentine’s day to all of you. Valentine’s day in Australia is more of a declaration of love between couples. But, if the nature of this special event is so much more encompassing or broader in Texas or the US, so be it. The more love the better. 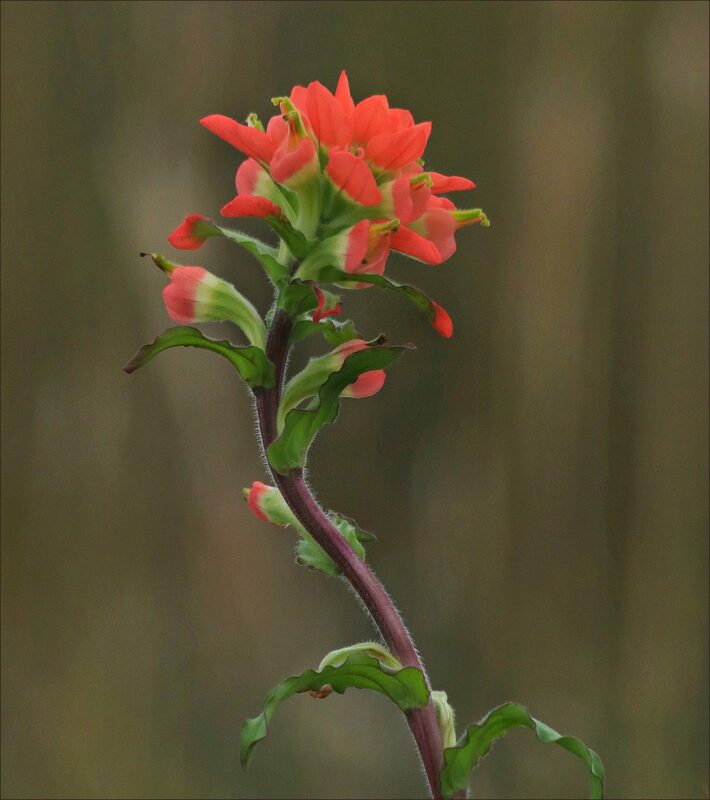 I love the colours of the flowers especially the Indian paintbrush. When I was in grade school, Valentine’s Day was a highlight of the year. We made valentines for our parents and classmates (think red construction paper, and cake doilies) and always had a class party with heart-shaped cookies and fancy cupcakes. We exchanged valentines in class, and decorated shoe boxes to use for collecting them. High times! The best part always was the heart-shaped box of candy: covered with faux silk and tied with a ribbon. The chocolates didn’t really matter — it was getting that box that was important. We kept everything from photos to “love letters” in them. Of course, 4th grade love letters are a genre all their own! These flowers were so vibrant and fresh — they really were quite a find. 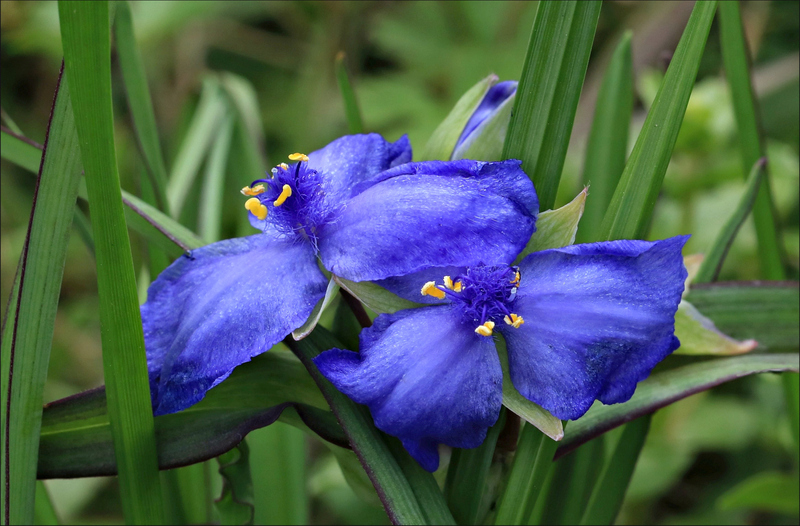 That’s a particularly nice shot of the Spiderwort, Linda. My few shots of the same plant don’t show half the detail yours does. If it’s any comfort, only two of my forty-plus images showed both flowers with some detail. I really had to work to find a position where I could manage to get them both in focus, and I wasn’t sure until I got the computer that I’d managed it. Part of the difficulty was that the area had been mowed at some time in the past, and these new plants were only about five inches high, so I had to get myself down to their level — and back up. Beautiful flowers, beautiful pictures! As I look outside at nearly two feet of snow now it’s hard to imagine! Happy Valentine’s Day! It sounds as if that snow you were getting decided that five or six inches just wasn’t enough! Two feet is enough for some great photos and an exceptionally happy Buster, even if some of the hiking trails and roads get problematic. I’m keeping these photos up for another day — they’re a bright spot in our dense fog. Warm weather is nice, but while we still have such cold water, we’re going to stay fogged in until the next cold front. Have a feeling Spring is about to spring — If the weather can ever decide to cooperate, that is! There’s no question you’re right. The changes are starting to pile up; yesterday I noticed how many trees are leafing out, and the buttercups, clover, and crow poison are running rampant. If we only could get rid of the fog: the real downside of such warm temperatures. Praying for a cold front’s a little odd in some ways, but I’d take a 20 degree drop to get rid of the danged fog.